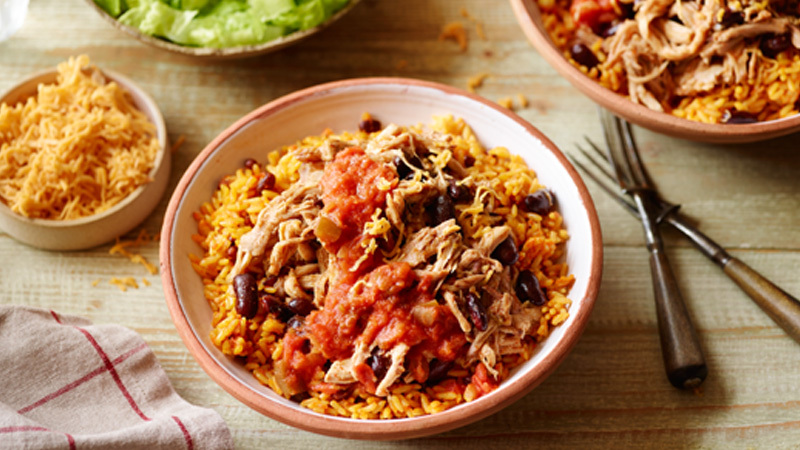 Skip the tortillas and serve a spicy pork filling on top of colourful Spanish rice. Olé! 1. If the pork comes in netting or is tied, remove netting or strings. Place the pork into a slow cooker with the beans, taco seasoning mix and chilli. Cover and cook on low heat setting for 8 to 10 hours. 2. Make the rice up according to packet instructions. 3. Remove the pork from the cooker to chopping board and shred. Return the pork to the cooker and gently mix with the beans. 4. Serve the rice in bowls topped with the pork, some cheese, lettuce and salsa. If you cannot get hold of Mexican style cheese, use Cheddar cheese as an alternative. Great also served with some soured cream and guacamole.